These are fun little bracelets that reinforce Subject and Predicate. 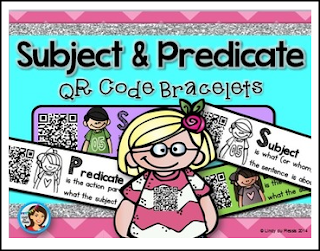 Each bracelet contains the definition of Subject or Predicate and has a QR code that is linked to a youtube video. This is a great way to reinforce or revise Subject and Predicate. Cut out the bracelets and color them in. Fold the right side of the bracelet under the other side of the bracelet and stick. Use an iPad, tablet or Smartphone to scan the QR code on the bracelet. The QR code will link to an online song (video animation) that reinforces subject and predicate.